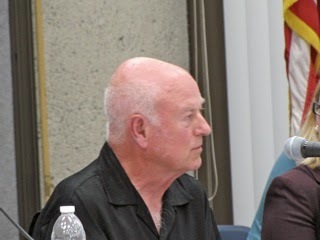 Guided by Chairman Dr. Richard Mehren and Vice Chair Steve Smith, and moving at a pace that would make a snail appear to be a Forumula 1 race car by comparison, the Fairview Park Citizens Advisory Committee crawled through the agenda, HERE, of their meeting Wednesday night. FINALLY, SOME FIELD USE NUMBERS! 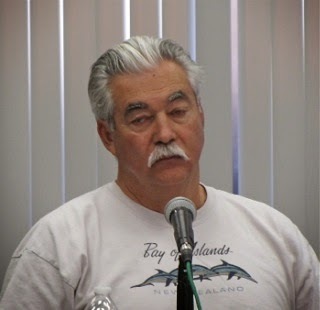 The diminished committee - member Brett Eckles was absent and member David Stiller passed away recently and has not yet been replaced - began by hearing a presentation on Field Use Allocation by members of the Costa Mesa Recreation Department. 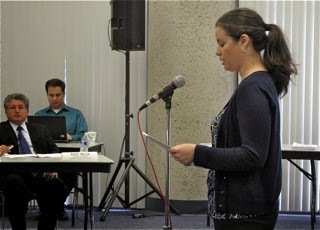 Assistant Recreation Supervisor Cecily Renteria led the discussion, assisted by Recreation Supervisor Lisa McPherson. The discussion was fairly straightforward, with clear descriptions of the various user group designations and headcounts from the previous years players. Member Anna Vrska inquired about the recent dislocation of long-time group 1 users from the TeWinkle Park Sports Complex in favor of Matt Leinart's Flag Football program. The response was that the decision was made by the "administrative staff" and the existing party line - they were not displaced, just given other fields and times - was played back for them. 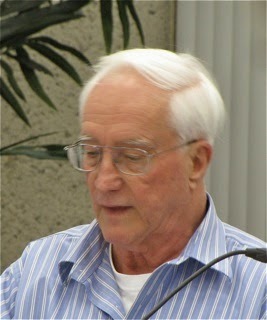 Member Ron Amburgey attempted to somehow defend the Leinart football program, indicating that they didn't even know they would be given a field this year. Lame excuse. Questions were asked about the departure of Recreation Manager Bob Knapp earlier this year. McPherson dodged that one, as she should. This is a very sticky wicket (sorry for the pun) and it was not her place to answer. More on a related story at the end*. At 6:45 the committee began discussing the dozen remaining items to be potentially considered for the Southwest Quadrant of the park. At the previous meeting they discussed the first dozen. After an hour of discussion only two items were given a "yes" vote, to have the staff analyze and return at the next meeting with possible solutions. Those two were #4 on the list, "Improve/Designate Bike Paths" and #6, "Plant Native Drought Resistant Plants Center of SW Quadrant". The second one was actually an extension of the work recently performed by Eagle Scout Christian Redman last month. All the remaining 10 items on the list for consideration were rejected by the committee as inappropriate for this particular quadrant of the park. 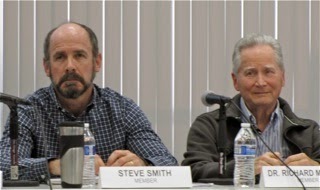 During the Committee Member Comments segment at the end member Terry Cummings told the group of the ongoing damage and theft at the Orange County Model Engineers location on the East side of Placentia within Fairview Park. He was very grateful for the huge public support following the first wave of damage. The police have been notified and, we were told, more incidents of vandalism occurred Tuesday Night. Cummings attributed at least some of the damage on kids, mentioning that it seems to increase near the end of the school year. 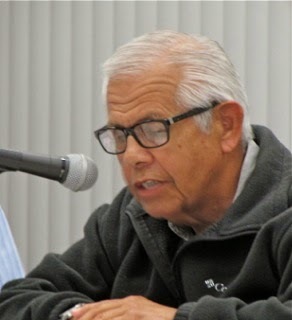 Ron Amburgey commented on the Field Allocation information and observed that most of the playing fields being used belonged to the Newport-Mesa Unified School District. Only six of the 27 are actually City sites and he opined that we needed more and hoped to find support from his colleagues for fields on the East side of Placentia when that section is discussed. Member Dennis Popp, grumpy most of the evening to this point, said he received several telephone calls - it turned out to be three - from people with suggestions but - he said - refused to come to the meetings because of the "hostile atmosphere". Well, I've been to all but one of these meetings and Mr. Popp is just plain full of manure on this issue. This reeks of stuff Steve Mensinger and Jim Righeimer used to pull at council meetings a couple years ago when angry residents spoke out about some of the things they were doing. Yes, people are passionate about retaining open space, and speak out accordingly, but there has never been any hostility. Popp also alluded to the packet of letters distributed with the information available that evening, saying that there were 50 letters and they should be considered. Well, I read through those letters and most look nearly identical. They look like someone in a parent group told their fellow rugby parents to send off form letters to the city about the shortage of fields. In fact, one letter in the mix appeared to include a guidance sentence about preparing the letters. It appeared that this was simply an attempt to stack the deck - roboletters, as it were. Member, and council candidate, Lee Ramos was next, following his campaign manager, Popp, and he promptly went into a defensive mode, alluding to having been referred to as "one of the guys" - whatever that means - then did a revised version of his stump speech, talking about growing up on the Eastside and emphasized that he enjoyed hearing from the public. Thank goodness he didn't talk about his coffees at Panera! He said something confusing about the committee shouldn't feel short-changed, but then, we were moving closer to his bed time, so I shouldn't really expect him to make sense. Dr. Mehren, who had a pretty shaky evening as Chairman, addressed the information provided by the Recreation Department team, opining that it was important for the committee because it had previously asked for that information but was not provided with it. The meeting adjourned very near 8:00 p.m., with the next meeting scheduled in May. Unfortunately, Barry Friedland and his Costa Mesa Brief cameras were not at this meeting. Apparently he told the City Staff that he cannot continue providing a video record of the meetings - they don't get enough views to justify his time and expense producing them. That's a shame, since he did a good job with it. I tried to do my part by plugging his productions - the hit counter jumped when I did so - but he apparently only has a very few regular viewers for his YouTube Channel. As mentioned above, there was big news in the Daily Pilot last night, HERE. Bradley Zint broke the story that Gordon Bowley, former President of Costa Mesa United and Chairman of the Costa Mesa Youth Sports Foundation, had resigned both those positions last month in the wake of his son-in-law, Bob Knapp, resigning and following the whole Leinart Football mess. In Zint's article Bowley makes some pretty scathing comments about City of Costa Mesa leadership. This is a VERY BIG story - one that will likely resonate throughout the community, and particularly in the youth sports community, where his family has been an integral part of improving sports opportunities for many years. After Ramos loses the election, he and Popp can go on tour with Circus Vargas. Clowns are always in demand. They can "pop" (pardon the pun :P) out of a giant jackboot marked "Boss Riggy." I'm concerned that Ramos isn't all "with us" a good share of the time. Have you ever spoken to that guy? You walk away shaking your head. Interesting about Bowley. That whole situation couldn't go anywhere except bad. He put a lot of himself into that group just to have it blow up. I'm sure Mensinger will destroy what's left. He left off the last word, Association. 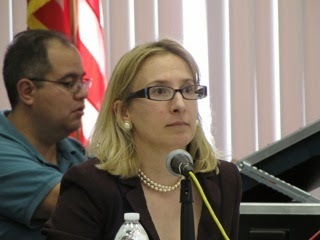 Weitzberg represents the true Costa Mesa taxpayer (lower case mine), not Fitzpatrick's beloved CMTA. Am also interested in how they try to spin Mr. Bowley's resignation as a positive. Any way you slice, that will not work to their political advantage. No mention of the "drainage pipe" project . Once again the City fails to consult with the proper agencies. Draining water from ESHA that contains a Federally endangered and protected species, is kind of an important detail. I am becoming thoroughly convinced the a Current City management is more committed to destroying habitat than stewarding the park. Fitzpatrick can mouth off all he wants. He doesn't know what is good for anyone, much less Costa Mesa taxpayers. Harold Weitzberg is a very intelligent, quick thinking and honest man. A breath of fresh air. This new guy, Chris Bunyon from the Banning Ranch interest sounds like a good candidate also. Anxious to hear more about him. Bunyan has run for a Council seat before, in 2006. Check out this link http://www.smartvoter.org/2006/11/07/ca/or/vote/bunyan_c/bio.html . Fitzy is just spewing what Riggy and the chest bumping, phone dropping bully Mensinger tells him to spew. He is nothing but a brown nosing boot licker who can't think for himself. So Dennis Popp is spreading false rumors that the committee meetings have a " hostile atmosphere". Wow- when you consider who Popp works for this is almost comical. 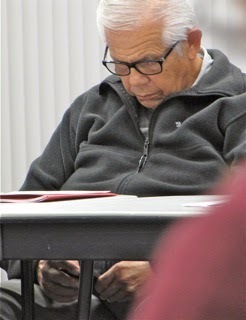 Then Mr. Ramos spends time texting instead of listening to others during the meeting. Now, who do we know who does that on the CM CC dais? These guys are something else! Be prepared, my fellow Costa Mesans. These shenanigans will only increase as campaign season is in full swing. So Popp isn't smart enough to know roboletters when he sees them? Or did he have something to do with their fabrication? And this guy is Ramos' campaign manager? As I said, I think he's one sandwich short of a picnic. Looks like Popp has the other sandwich.